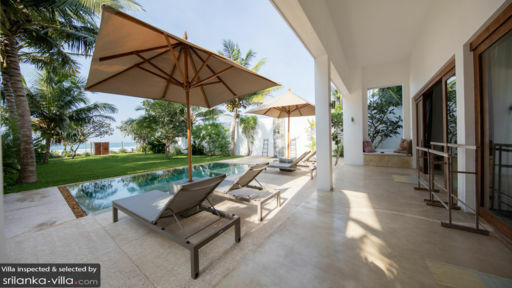 Elegant and contemporary, Elephant Palace is a three bedroom villa set alongside a prime beachfront location close to Galle. Featuring sun-dappled grounds, tastefully furnished living spaces and a sparkling pool, the holiday home is ideally kitted out for two couples (with or without kids), or for sharing among a group of four to six adults. Guests are comfortably accommodated in two generously proportioned bedrooms with sea-facing balconies. Air conditioners, canopy netting and block out curtains help facilitate uninterrupted sleep, and there’s ample storage space for your belongings. The attached en suite is outfitted with twin vanities, a toilet and shower recess. The third bedroom is of a smaller size and suitable for kids. Taking a dip at Elephant Palace’s glistening pool is a great way to beat the heat of the tropics. Beach chairs and recliners are laid around the pool, so you’ll have a comfy spot to dry off after your dip. A well-manicured lawn dotted with palms stretched out from the pool area right out to the beach - so you’re only always just steps away from a swathe of golden sand and the ocean. 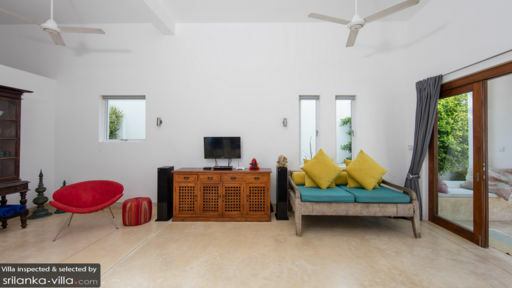 Each of the living spaces at Elephant Palace are light-filled, airy and spacious. Neutral shades of white, beige, and grey dominate within, with home accessories in a dark cyan hue adding pops of colour throughout the main living area. Set in an open layout, the main living area features a lounge and dining area. It opens out towards the verandah and pool, and contains a partition that hides away a fully equipped kitchen and storage room. As a full-service villa, Elephant Palace offers housekeeping, security and in-villa dining services. 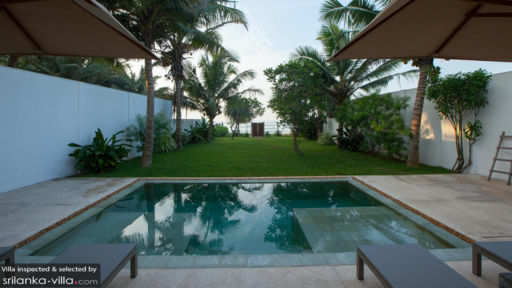 Located in a prime seafront located close to Galle, Elephant Palace puts villa vacationers within easy access to a variety of attractions. The scenic Koggala Lake is less than 10 minutes’ drive from your villa; taking a boat ride across the lake in the late afternoon is a great way to unwind before the evening. While you’re in the vicinity, stop by to visit two noteworthy Buddhist temples on the lake: Yatagalla Temple and the Japanese Peace Pagoda at Rumasalla. Hop into a car for a 30-minute ride to the UNESCO World Heritage site of Galle Fort. A stroll across the fortified town is the best way to explore the venue; you’ll set sight on beautifully restored Dutch colonial buildings and churches, and chance upon a wide-ranging variety of boutiques, cafés and restaurants. Kabalana Beach stretches out from beyond your garden at Elephant Palace. Apart from picture-perfect seascape, it’s also one of the few beaches along the south that’s ideal for swimming and for learning to surf - the waters remain shallow and there’s no rocks or reefs present in the bottom. You’ll find a surf school just a skip away from your villa. Experienced surfers will enjoy catching the waves at Weligama. Just across from your villa is an excellent restaurant known for its oysters and lobster prawn dishes. You’ll also find bars, beach clubs and spas along the coastal road on your way to Galle. Unawatuna, located a 20-minute drive away offers a vibrant dining and nightlife scene. Elephant Palace – is a dream holiday in Sri Lanka. Located right on the most beautiful clean sandy beach, it gives both privacy, and the easy access to places of interest - if you choose to! We often found so spoiled by the tranquility of the villa, that we would rather stay there and fully enjoy the experience. Very child friendly, it’s got a lovely pool cleverly designed for both kids and adults. Ample living area provides lots of space and air for everyone to chill out. Impeccable service from the houseboys and the cook made us feel welcome and spoiled. We definitely would come back to enjoy it again. We stayed at the Elephant Palace for 10 nights in total and fell so in love with the place we had the blues for 2 days before we were due to leave. Lara & Rob were super helpful in terms of providing information before our arrival and even arranging our airport transfer. They also offered up solutions when the power was unexpectedly cut a few times, which was out of their hands. The villa is gorgeous with a good sized pool that is perfect for little ones as it has 2 shallow platforms for them to play on. Beyond the pool is a lovely garden with coconut trees and beyond that is the best beach we have ever visited! Let me tell you why: we had direct access from the garden to the beach so we did not have to pack tonnes of stuff with us and could just run back to the villa within seconds if we needed anything; the sand is soft and powdery; there are always people on the beach but it is never crowded; the water is warm and stays shallow for quite a way in so again great for kids to splash around in and is wavy enough for surfing! There are plenty of tuk tuks on the main road at the front of the villa so it is easy to get around. The villa comes with a chef and housekeeper who were wonderful. They were so sweet and accomodating and enjoyed playing with the children (1yr old and 2yr old). Danushka's breakfasts and fruit juices were delicious and Sampath's crab, spring rolls and daal were the tastiest we've had! In terms of activities, the pool and beach kept us all busy most of the time, but we also managed to try surfing (perfect beach for beginners and there is a fantastic surf school next door at 7th sky idyll) and had a few private yoga sessions at the villa. We travelled as a group of two families and there was something for everyone. We are sad to be back in the UK and are already trying to plan our next trip out to Elephant Palace where we created some wonderful memories.